Italian writer, essayist and a head of the Adelphi publishing house. He read English Literature at the Rome's La Sapienza University. In 1962, he began working for Adelphi Edizioni. He belongs to an elite of European intellectuals and is compared to Erich Auerbach and Ernst Robert Curtius. He is the author of: L’impuro folie (1974), La rovina di Kasch (1983). Polish readership will remember him mostly as the author of the outstanding book on Greek myths Le nozze di Cadmo e Armonia (1988) (The Marriage of Cadmus and Harmony) (Stanisław Kasprzysiak's translation into Polish published in 1995). In another book titled Ka: Stories of the Mind and Gods of India, the titular Ka is one of Prajapati's names, the master of all creation, literally meaning who? (Polish translation by Ireneusz Kania published in 2008). Another book published the same year, Literature and Gods, is the outcome of the prestigious Weidenfeld Lectures Calasso delivered at Oxford in 2000. These are extraordinary tales about traces left by petulant gods in works by such authors as Hölderlin, Nietzsche, Lautreamont, Baudelaire and Mallarmé. Calasso puts forth a concept of absolute literature, which not only pursues aesthetic objectives, but also has a specific epistemological value. 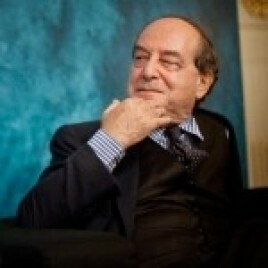 Calasso argues that only through such literature a certain kind of knowledge may be exposed. Dariusz Czaja wrote that, “in his activity, Calasso indefatigably creates compelling meditations about the fascinating fabric of literature; meditations varying in rhythm, colour, register and density. These are meditations on how fleshes of the invisible made impression on great works of the Western world.” The Italian writer was a guest of the 3rd day of the Conrad Festival.